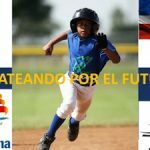 Home / Blog / Juan Guzman Complex – We Keep Moving Forward! Thanks to the Contributions received in the III Gala “Bateando por el Futuro” we keep moving forward! These are some recent images of the construction of the Juan Guzmán Manoguayabo Sports Complex. This is just the beginning of many good things for our young people in the DR community. Again, we want to say THANK YOU SO MUCH to all the people who have made this possible through their support and collaboration.